I finished up Speaks the Night Bird by Robert McCammon over the weekend. Set in early colonial America, it qualifies firmly as a historical mystery and checked week 9 (a book in the middle of your To Be Read List) off. The plot revolves around a town in today's South Carolina at the edge of "civilization" before the Indian and Spanish-held lands of Florida take over. The story opens with a magistrate and his young clerk (who is the focus of the story) heading to Font Royal to hear the testimony of locals about a witch in their midst. There's a lot more going on in this little backwater town than just the witch trial, which the clerk soon finds out and puts his inquisitive nature towards figuring out. A bit slow in a few spots, it's otherwise a very good read - the last half of the book picks up steam until the point where I didn't want to put it down. I gave it 4/5 stars. If you decide to try this one, it's the first in a series, FWIW. Since I visited my parents this weekend, my dad had a book recommendation and a print copy to hand off to me, so I decided to substitute that in for week #26 - an adventure book. The 100-Year-Old Man who Climbed Out The Window and Disappeared by Jonas Jonasson is a fun romp thru 20th century history. A bit like Forrest Gump, Allan Karlsson seems to find himself involved in all sorts of important historical moments, but really, he's just arrived for the vodka. Deciding to remove himself from the assisted living facility which is throwing him a gala 100-year birthday party, Allan steps (carefully, because he's a centarian) out the window of his room into the flower bed and then departs for the bus station in search of adventure. Told in flashbacks throughout his life, Allan collects a cast of oddball friends along the way, including Sonya, the elephant, as well as a large suitcase containing a very large pile of cash. Fun, quirky, and a very entertaining read! I'm going to start Stronger than Magic tonight for week #52 for a book set in a fictional location. Currently standing at 43/52 books read with 9 left to go this year! 3. A book you meant to read in 2016: A Touch of Stardust by Kate Alcott. 16. A mystery: By Book or by Crook by Eva Gates. 26. An adventure book: The 100-year-old man who climbed out the window and disappeared by Jonas Jonasson. 30. A book from Goodreads Top 100 YA Books (link): The Raven Boys by Maggie Stiefvater. 34. A book set in or by an author from the Southern Hemisphere: The Bone People by Keri Hulme. 38. A novel inspired by a work of classic literature: Lady MacBeth by Susan Fraser King. 40. A book published in 2017: A Beautiful Poison by Lydia Kang. 42. A best book of the 21st century (so far): The Shadow of the Wind by Carlos Ruiz Zafon. 44. A recommendation from "What Should I Read Next" (link): The Dark Mirror by Juliet Marillier. 47. A past suggestion that didn't win (link) - A book you saw a stranger reading: The 19th Wife by David Ebershoff. 48. A banned book: So Far from the Bamboo Grove by Yoko Kawashima Watkins. 52. A book set in a fictional location: Stronger than Magic by Melinda VanLone. I pushed a few books in front of Speaks the Night Bird this week to read. I zipped through week 36's Hugo award novella The Lady Astronaut of Mars by Mary Kowal. A bittersweet gentle short read. Reminded me a lot of the Ray Bradbury sci fi of the late 70s. Next, my library had informed me that my request for them to add I Capture the Castle to the ebook collection had been granted, so I went ahead and grabbed that one and read it this week. (Topic is week 39, an epistolary fiction). Eccentric British family as told from the point of view of the younger daughter, Cassandra, through her journal entries. A coming of age book, sweet and quiet. Nothing crazy or over the top, but I enjoyed this read that harkened back to a (perhaps) simpler time before the war. I'll pick Speaks the Night Bird by Robert McCammon back up this week and go on from my current stopping point with this one. 26. An adventure book: Labyrinth by Kate Mosse. I finished up my Gravel Socks last night and aren't they fun? I knit these using Wooly Wonka Fibers Beryl Sock. The colorway is Under the Cherry Tree. While I'm not normally a fan of loud, handpaint colorways, for whatever reason (purple?) I love how these turned out. The front has a simple knit/purl textured pattern that helps to break up the handpaint. (Although nicely enough, this colorway doesn't particularly pool). The back of the leg/sole is just basic stockinette. I used the Fish Lips Kiss Heel for my heels on these. Because the Beryl Sock is a bit plumper than many sock yarns, I went down to the 56-stitch leg circumference size and they fit perfectly. I've also cast on for a lace/stashbuster project: Romi Hill's Sagebrush Infinity Scarf. I'm using a skein of a merino singles from Tale and Tendril's Etsy shop in the Gringots colorway. Just a few repeats in and, as with a lot of lace, it doesn't look like much at this point - but I love the colorway with this pattern and it's knitting up into a deliciously soft fabric. I'll be working on that as a travel project next week. I also dyed up yarn yesterday for a new sweater: Comfort Fade Cardi. I had been toying with the idea of knitting up one of these "fade" cardigans to showcase some yarn colorways for the shop, but when Drea Renee Knits released this one yesterday, that shawl collar just grabbed me so I dyed up a sweater's worth of DK merino for myself yesterday and I'm going to cast on for that tonight! I've been concentrating on just a couple of projects so far this month. I put in 5 days of work on my Desert Mandala from Chatelaine and finished up all the cross-stitching for the center medallion. 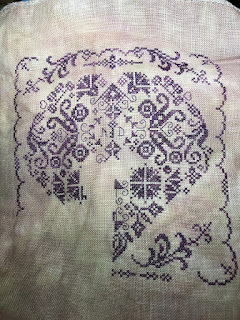 The only thing left to finish on this is the backstitching of the little pink flowers/cactus leaves, and of course the beading (which are the open/non-stitches spaces throughout), but I'll be doing that at the end. I feel like I should be able to accomplish the backstitching in one decent stitching session in November, and then I can start section 2, which is the saguaro cacti around this center piece. I need to finish up the cross-stitching and then backstitch this block (and whew! there's a LOT of backstitching in this one). Once I get this block done, I'll go back to working on my Star Weaver from Heaven and Earth Designs for the end of the month - with one exception which is I'll be starting a new October/Halloween themed full-coverage piece this weekend: Witch Way. I love the artwork (by Molly Harrison) in this piece! I finished A Touch of Stardust by Kate Alcott for week #3 - a book you meant to read in 2016. I would agree with many of the Goodreads reviews that it could have used a bit more focused editing. I found the multiple story lines a little distracting and honestly, I would have been glad to have less coming-of-age angst for the narrator and more info about Gable and Lombard. That said, I enjoyed this as a lite read. The author does do a great job developing Carole Lombard's character throughout the book, and as a Gone With the Wind fan, it was have the filming of that epic movie be the skeleton on which the rest of the narrative was hung. Good, not great; an entertaining read. Since those are both finished, I grabbed Speaks the Night Bird by Robert McCammon to start today for week #9 - a book in the middle of my To Read list. I haven't started this one yet, but I'll report back next week! 52. A book set in a fictional location: The Eyre Affair by Jasper Fforde. I finished A Death in Sweden for week #15. This normally would not have been my sort of book - and I think perhaps I liked it better as an audiobook than I would have as a written read. I really liked the narrator of this version. The plot is somewhere between John le Carre and the Jason Bourne type spy books. There is a fair amount of violence, and I appreciated that the author didn't make this one have a happy ending. (At times I thought we were going there, but the main character, while he has some redeeming qualities is, at the base of it all, a paid killer, and I actually was impressed the author didn't take the easy road out of the plot twists.) If you like spy-type novels, you might give this one a try. I also finished Lady MacBeth by Susan Fraser King for week #38 this week. The middle section dragged a bit - it's hard to have intrigue happening in remote places over half a decade be but so interesting since the main characters mostly just talk about possible plots and there's not a lot else happening. However, that bit aside, I loved the characters drawn in this historic telling of MacBeth, King of Scotland, and his wife, a queen in her own right. I really appreciated the 5 or 6 pages of notes at the end in which the author discussed what bits of the history we actually can verify, what leaps of faith she took, and how the story fit into Shakespeare's Tudor era in terms of claims of throne and the rights of kings. I also really liked the way the author wove together the Celtic/Gaelic traditions with the "new" traditions of Christianity and how the population managed to be on both sides of this divide. Nicely done and a recommended read if Marion Zimmer Bradley is your sort of author. I've just started A Touch of Stardust by Kate Alcott for week #3 - a book you meant to read in 2016. I picked this up since I love Carole Lombard. Some mixed reviews on it, but we'll see how it goes.